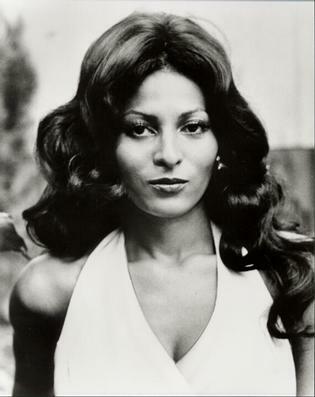 Pam Grier: Larger than Life and ALWAYS Foxy! 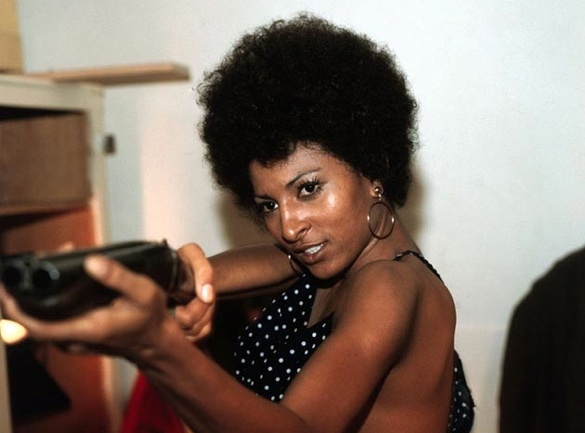 The theme of the 2012 Horrorhound Weekend was “Women of Horror.” While Pam Grier isn’t necessarily a horror queen, she is the quintessential blaxploitation actress an absolutely grindhouse royalty. If that isn’t enough for purists, her having SCREAM BLACULA, SCREAM on her resume,’ certainly justifies her spot at this event. Grier was located in her own private signing area in the hotel but fans had no trouble finding her as her line remained constant. After the Horror Host Hall of Fame Induction Ceremony had ended, my co-blogger David and I had but a few things left on our Horrorhound “to do” list. One of these was to locate Grier and obtain a signature for our friend, Richard Braden. Braden has been indispensable to us “technically challenged” Daves in not only handling the site’s issues (of which there are many) but also creating banners and our site’s main header. We often receive compliments regarding the overall “look” of TERROR FROM BEYOND THE DAVES and this is in no small thanks to Richard! As he is an autograph collector, we always offer to get him something when we attend one of these events. Although Richard has a knack for requesting the most elusive or rogue celebrities (see Gary Busey story HERE) he is absolutely worth it. When we arrived at her signing location, Grier had been doing a Q&A panel but her fans waited patiently. We decided to remain as well which was a good choice since her autograph line was cut soon after our arrival. Though we weren’t sure how long before she’d return, we were content knowing Richard would receive his autograph and we Daves would be in the presence of a legend. Grier’s celebrity, though far from conventional, still remains proof of the American dream. She’d been working as a receptionist for American International Pictures (AIP) before being discovered. She would soon make her mark in two notable exploitation genres; blaxploitation (low budget sub genre films geared towards an African American audience) as well as “Women in Prison” features. Whatever the genre or role for which she played, you couldn’t take your eyes off of her! This statuesque beauty not only packed major confidence and “attitude,” but often a suitable weapon to match! Robert Ebert once noted that Grier had a “kind of physical life missing from most actresses.” In this, we are in complete agreement. We didn’t have long before the diva returned. Soon after we entered her signing area which had a large table full of numerous photos to choose from along with a boom box playing Al Green’s “Let’s Stay Together.” Per Richard’s request, we chose a shot her playing the title role in Quentin Tarantino’s JACKIE BROWN – a film that jump-started her career back in 1997. I am a huge fan of Tarantino and, aside from his considerable skills as a director, am forever grateful to him for consistently paying homage to exploitation cinema. We stood together for a photo and I couldn’t help noticing that, while David was about her height, I was tall enough (though a tad too wide) to be paired with Grier. Then again, I had no illusions that if push came to shove, she’d have no trouble taking me down with or without the pistol! This entry was posted in Celebrity Encounters!, Convention & Expos and tagged Foxy Brown, Jackie Brown, Pam Grier, Quentin Tarantino, Scream Blacula Scream. Bookmark the permalink. ← HORROR HOST LOST AND FOUND: Professor Headstone!